It is truly amazing how much your health is affected simply by the foods that you eat. You can, for example, actually stop the progress of many chronic diseases by eating right and following doctors’ orders. Even heart disease can potentially be reversed by following a few major recommendations from your physicians. Maintaining a healthy diet is one of the most important things you can do for heart disease. Cooking for someone who has heart disease might sound daunting. Especially if you are accustomed to the “standard American diet”, it can be a bit of a learning process at first. Once you get started, however, you will learn that healthy cooking for heart disease is actually very simple and the results are delicious. First and foremost, you want to avoid all of those processed foods that the vast majority of Americans live on. Throw out all of those flavored rice and pasta boxed meals, all of those foods are only serving to make you sick. So many of those processed foods are barely food at all, and are basically glorified flavored chemicals. Instead, focus on real, whole, delicious natural foods that you were actually meant to eat. You will usually find the best foods by shopping at your local Farmer’s Market. In your favorite grocery store, most of the healthiest foods are usually found in the outer perimeters and outer aisles, especially around the produce section. You might be wondering what you could possibly fill your plate with instead of all those processed foods you used to eat. The answer is simple: produce. Studies show that a primarily plant based diet can help heart disease even to the point of potentially reversing it. Most American’s consider vegetables a side dish at best, and often they are covered with fat and sugar. Filling your plate with steamed, sautéed, or roasted vegetables will help fill both your plate and your tummy. Vegetables are so versatile that some simple spices can completely alter the flavor of each dish. On top of avoiding processed foods and replacing them with real, whole grains and fresh produce, you need to cut out the junk. This is the part that many people find a little difficult, but it is very important. The best healthy cooking doesn’t rely on fats like butter and oil, sugar, or tons of salt. Use very small amounts of extra virgin olive oil or coconut oil when needed, or try using broth instead of any oil at all. Instead of salt and butter, try flavoring your food with herbs and spices, and tasty additives like lemon juice. To further cut down on fats, consider using nut milks as replacements for many dairy products like butter, cream, and milk. 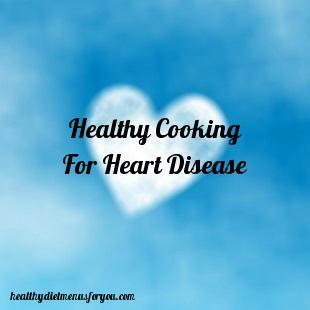 Healthy cooking for heart disease is so simple, anyone that tries can accomplish it. The hardest part is simply getting into the habit of using different foods and products, and you will get used to that in no time at all. Use these tips to get started and check out my meal plan if you want more ideas.